and the students can use their SPARK units and probes to develop hypotheses, collect data to prove or disprove the hypotheses, and then draw conclusions. PROS: The SPARK comes with more than 60 preinstalled experiments. It is rugged enough to be taken outdoors and handled by elementary-, middle-, and high-school students. 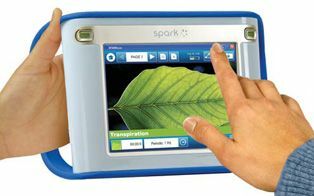 The SPARKvue software permits the same interface to be displayed on a computer so a teacher can deliver pre-lab instruction to an entire class via a data projector. Additional probes are reasonably priced. The SPARK is battery-powered, so it can be used outside the classroom. It allows students to record their data directly to the device. The experiments included in the SPARK let students collect meaningful data in real time. The device also has helpful online educator-training resources. CONS: It would be nice to have one kit that included all the probes; PASCO does, however, offer kits that provide the probes necessary to perform the labs that are embedded on the SPARK Science Learning System. OVERALL IMPRESSION: Science is not a study of facts and dates; science is a process. The SPARK takes this discovery process into account in a fun, easy-to-use tool.